The term power electronics encompasses a wide range of applications, from small power converters used in personal computers to large scale electric power generation/transmission systems. Because power electronics is essential to these functions, having robust and reliable power electronics circuits is extremely important. 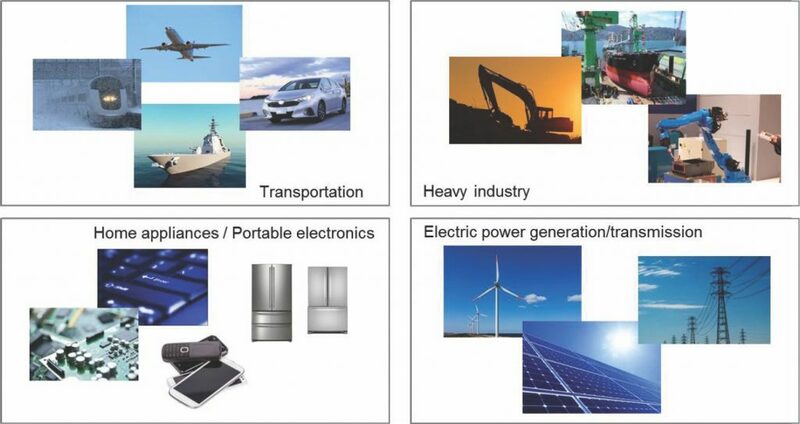 Figure 1 illustrates the broad range of power electronics applications. 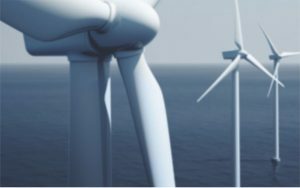 Many industries (such as transportation) are becoming increasingly electrified, with electronic circuits replacing older technologies such as internal combustion engines and hydraulic actuators. What Should Power Circuit Designers Do? 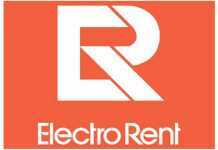 Power electronics engineers have to develop highly efficient, safe and reliable electric circuits, so the evaluation of final circuit characteristics is very important. It is therefore mandatory to evaluate the efficiency of the entire circuit, including verifying current and voltage waveforms at each circuit node. To achieve this, a detailed understanding of the power devices and components used in the circuit is necessary. What Should Power Component Manufacturers Do? Due to the increasing use of WBG devices, the demand for greater energy efficiency and the need for improved reliability and safety, power device and component manufacturers need to understand that the information they have previously been providing power circuit designers is no longer sufficient. In addition to conventional parameters and characteristics curves under typical conditions, power electronics circuit designers need component data taken under many different operating temperatures, voltages and currents. Moreover, in addition to IV parameters other device characteristics such as gate charge (Qg) and FET junction capacitances (Ciss, Coss, Crss) are also now very important. 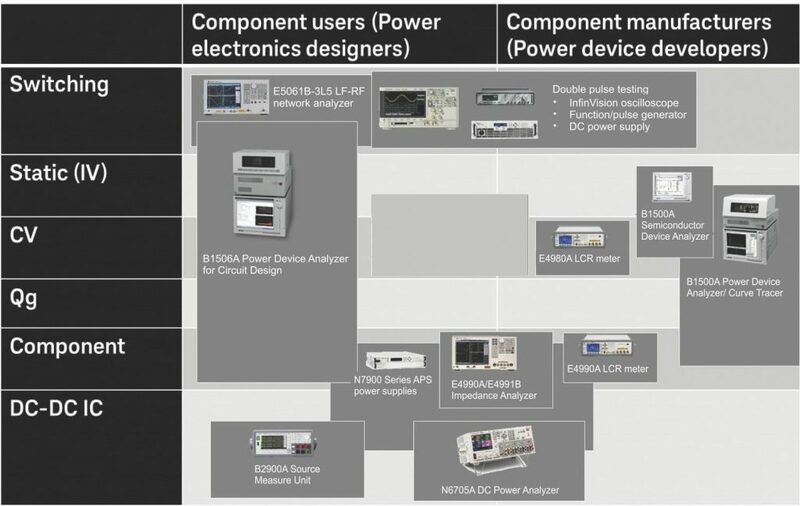 Providing more detailed characterization information to power electronics circuit designers and engineers is essential to remaining competitive in the marketplace. 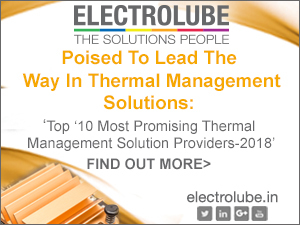 The following summarizes the major challenges facing power electronics circuit testing. There are two main phases in power electronics testing. The first phase is power component level testing and the second phase is power converter/inverter level testing. 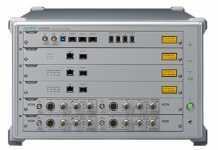 The following sections describe the Keysight solutions available to test both of these phases. The B1506A Power Device Analyzer for Circuit Design is a complete solution that can help power electronics engineers maximize the efficiency, safety and reliability of their products. It can evaluate all relevant device and component parameters under a wide range of operating conditions, including IV parameters such as breakdown voltage and on-resistance, as well as three-terminal FET capacitances, gate resistance, gate charge and power loss. 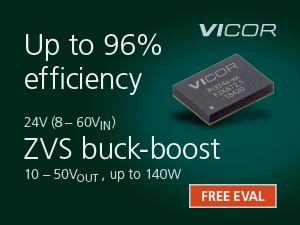 The B1505A is a more flexible alternative to the B1506A that offers wider current and voltage ranges (up to 10 kV), better low-current measurement accuracy, high voltage with medium current measurement (e.g. 500 mA at 1.2 kV) capability, a GaN current collapse testing option and the ability to measure more than three pins simultaneously. The B1505A can also measure both on-wafer and packaged devices. The B1500A is the de-facto standard instrument used by small signal semiconductor device engineers and manufacturers to analyze device characteristics and improve the device manufacturing process. It supports all aspects of measurement, such as fundamental current-voltage (IV), capacitance-voltage (CV) and QSCV (Quasi-Static Capacitance-Voltage) measurement with uncompromised measurement reliability and repeatability. In addition, B1500A supports a unique Waveform Generator/Fast Measurement Unit (WGFMU) module that contains an arbitrary waveform generator (AWG). 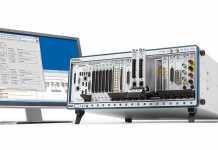 Switching characteristics are an important part of component level test, and Keysight has both oscilloscopes and pulse generators that can help evaluate these parameters. The InfiniVision 3000/4000/6000 X series oscilloscopes provide good bandwidth and resolution at a reasonable cost, and they support both current and voltage probes. The81160A Pulse Function Arbitrary Noise Generatoris also able to provide voltage pulses fast and large enough to characterize automotive components. Power components such as inductors, capacitors, resistors, resonators and MEMS sensors are important power electronics circuit components. Some of them can be tested using the B1506A Power Device Analyzer. 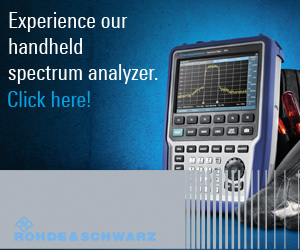 If characterization at frequencies higher than 1 MHz is necessary or components such as resonators need to be evaluated, then the E4990A or E4991B Impedance Analyzers are the best choices. They are industry standard instruments for impedance measurement and they provide unparalleled accuracy with real world characterization under various operating conditions. Measurement frequencies for the E4990A and E4991A go up to 30 MHz and 1 GHz (respectively). Conventional battery charging and discharging test uses a switch to transition from charging to discharging. However, this method introduces timing delays which are not present under real world operating conditions. Moreover, if a diode is used in the switching circuit then the power supply has to be quite large in order to supply sufficient current. The N7900 Series of dynamic DC Power Supplies and the N7909 Power Dissipater Units solve this issue by being able to both source and sink current. A benchtop SMU with two channels can simplify the otherwise complicated test setup necessary to perform DC-DC converter characterization. In addition to components, Keysight also provides solutions to characterize the inverters and converters that constitute the basic building blocks of power electronics. Since an efficient power conversion circuit is essential, being able to evaluate the entire inverter/ converter circuit is also necessary to optimize performance. In addition, inverter/ converter circuits must be stable and reliable and meet Electromagnetic Interference (EMI) specifications. For EMI testing, signal and spectrum analyzers are useful tools to detect signals at unexpected frequencies emanating from a circuit board. If such signals are detected, then corrective actions (such as increasing the shielding) can be performed. 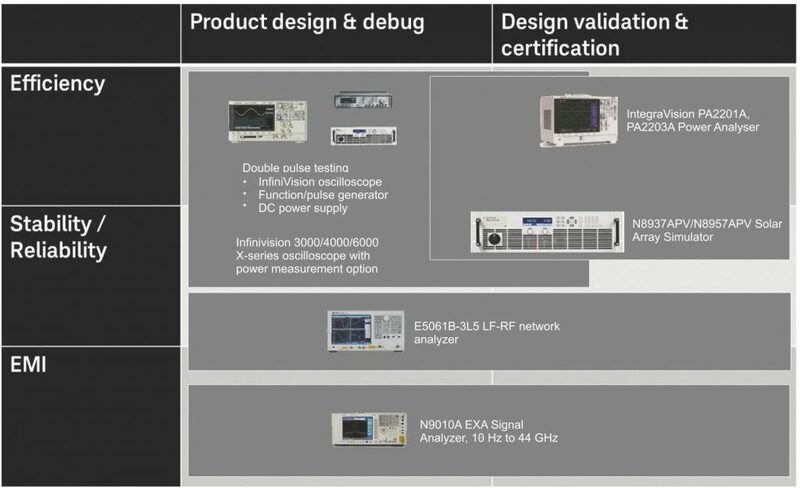 The Keysight InfiniVision 3000/4000/6000 X-series of oscilloscopes with the power measurement option has the ability to analyze many power analysis parameters, including current harmonics, inrush current, switching loss, slew rate, modulation, output ripple, turn on/turn off, transient response, PSRR, and efficiency. In the initial product development phase, having the ability to measure these key parameters and check their behavior at each node is very important. Therefore, an oscilloscope combined with the appropriate pulse sources and power supplies creates a very effective tool to evaluate inverter/converter functionality. For validating the power efficiency of a power electronics circuit, the Keysight PA2201A IntegraVision power analyzer is an excellent choice. You can capture voltage, current, and power waveforms on each of the PA2201A’s two channels, and you can view all six of these waveforms simultaneously with 5-MS/second sampling, 16-bit digitization, 2-MHz bandwidth and 0.05% basic accuracy. To enable a DC-DC converter to respond quickly to the load variations of modern high-speed LSIs, it is important to optimize the balance of response speed and stability within the feedback circuits. DC-DC converter loop gain is a good indicator of the DC-DC converter’s voltage regulation stability. Loop gain’s amplitude and phase characteristics across frequency show its stability and responsiveness. Phase margin, which is the difference between the phase angle of the loop gain and zero degrees, and gain margin, which is the difference between the loop gain’s amplitude and zero dB at the frequency at which the phase angle is zero degrees, are key parameters for loop gain stability. Crossover frequency, which is defined as a frequency where the loop gain is equal to one (= 0 dB), shows the response speed to load variations. The E5061B-3L5 LF-RF ENA Series Network Analyzer can evaluate all of the key parameters and characteristics listed above. The continuing expansion of solid-state power electronics into more applications has created many challenges for power electronics engineers and power device/component engineers. The goals of improved operating efficiency and increased safety also require that power electronics circuits and their components undergo much more extensive testing than they did in the past. Keysight Technologies provides a variety of solutions that cover both traditional and leading-edge power electronics testing needs.